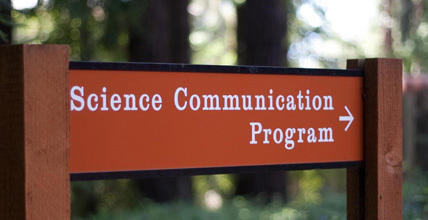 The Hearst Foundations have awarded a grant of $100,000 to UC Santa Cruz to support the campus's nationally recognized Science Communication Program. The two-year grant will help cover instructional costs, fund an expansion of the program's digital media training, and support efforts to recruit a diverse cohort of graduate students. "We are grateful that Hearst recognized our pivotal role during a time when accurate and engaging science communication is more important than ever," said program director Erika Check Hayden. "As the only science communication graduate program based at a public university, we provide the highest quality of instruction to students who represent the face of California and the nation." Founded in 1981, the Science Communication Program focuses on practical training through rigorous coursework and diverse internships. It is the only graduate science writing program in the United States that requires a degree in science and experience in research. Graduates of the program work as reporters and editors at the nation's top newspapers, science magazines, online news services, research agencies, universities, and medical centers. The program's multimedia curriculum is designed to meet the growing demand for full multimedia proficiency in entry-level journalism positions. The Hearst grant will fund a significant upgrade of digital media training through new equipment purchases and instruction from experts in the field. The director is the program's sole faculty member, with additional instruction provided by professional journalists and guest editors. Much of the grant will be used to support this corps of nationally prominent lecturers and guest editors, who train students to professional standards and help open career doors for the program's graduates. The grant will also support recruitment efforts, including outreach to communities that have been underrepresented in the science communication field. The Hearst Foundations previously awarded $100,000 to the SciCom program in 2011-14 to support instruction by professional journalists in the San Francisco Bay Area and guest lectures by prominent national reporters and editors. The Hearst Foundations, made up of the William Randolph Hearst Foundation and the Hearst Foundation Inc., act as a philanthropic resource for organizations and institutions working in the fields of education, health, culture, and social service.